Standard dorm rooms lack personality, yet vibrant college students don't. Since living quarters can influence our mood, it's essential to create a dorm that inspires students in a variety of ways, whether that be to study, unwind, or feel at peace. The challenge becomes how to decorate a dorm room on a budget without making permanent changes. The solution is to do-it-yourself. These DIY dorm decor ideas are innovative, inexpensive, and inspiring. Happy decorating! If you want to fill a large wall, create a wall hanging using your favorite photos of friends and family members. To make the photo art seem more cohesive, print out each photo either in black or white or all using the same filter. Instead of buying an expensive bulletin board, make your own. Buy a piece of cork and cut it to size. Next, decide how you want to add style to the piece. Wrapping string around the bottom adds more visual interest to the board and also gives you an extra place to stuff important papers without needing a push pin. One of the first things to do when moving into a dorm is finding a place for everything. Staying organized is essential to making the most of such a small space. However, your storage solutions don't need to be drab. Add some personality to wall hooks by making your own using polymer clay. If you pride yourself on a cohesive, fun Instagram feed, why not show it off on a bare dorm room wall? There's no need for nails or hammers with this project. 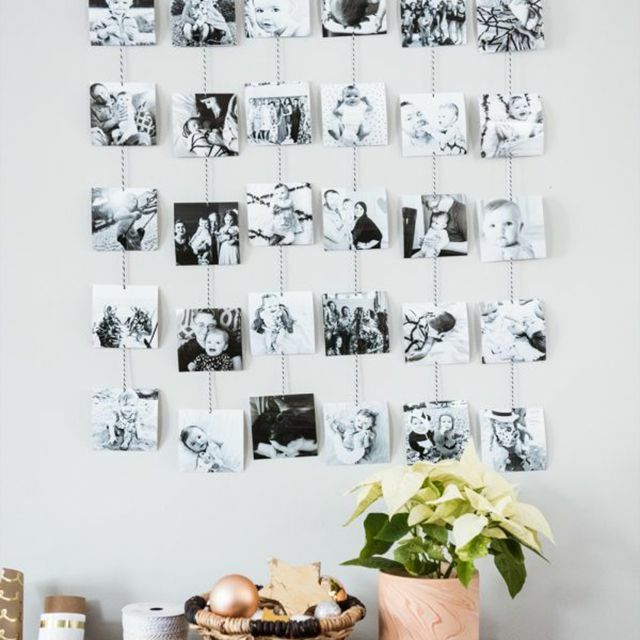 Simply print off your favorite photos, create an evenly spaced grid on the wall, then adhere using different patterns of washi tape. Dorm room decor isn't meant to be taken too seriously. Infuse some fun elements into the small space, like pom poms or sequins. Search the internet for free art prints that appeal to your aesthetic for an inexpensive way to add wall art to your space. Chances are that a dorm room is lacking on natural lighting. However, houseplants have many benefits besides being pretty. 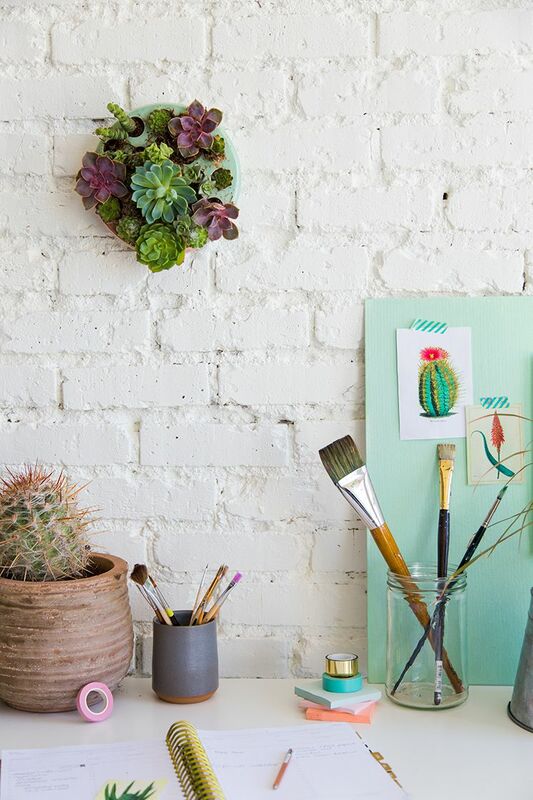 Add some life to the space by creating a wall planter, and opt for succulents because they are easy to grow in a dorm environment. Succulents are easy to grow in low light environments, but if you're lacking a green thumb entirely, consider making faux succulents instead. Build your own indestructible terrarium by crafting a variety of succulents out of felt. When living in a house or apartment, it's easy to hide a laundry hamper in a closet or somewhere else out of sight. In a dorm room, chances are your laundry is going to be out in the open. Take the opportunity to turn your laundry hamper into a piece of decor that blends in nicely with the room. This playful end table DIY project incorporates a lightweight geometric wastebasket that doesn't feel too bulky in a small space. Simply adhere a piece of wood to the top to create a functional end table. The entire project should cost around $30, which is significantly less expensive than buying a premade nightstand. If you want to add more texture and interest into your dorm, don't skimp out on throw pillows. Mix different fabrics, colors, and patterns until you achieve your desired look. If you like the pillow shown here, learn how to make it using denim and a bleach pen. It's tempting to bring along your childhood desk to save money regardless of how it fits in the space. Instead, opt to make your own desk that will be much more streamlined and stylish. Inexpensive neutral lampshades lack personality, but changing them out doesn't need to be a huge undertaking. Instead, cover your existing lampshade with a fun fabric that is in keeping with the design of your dorm room. This DIY dorm decor project is innovative and extremely budget-conscious. Search around for some leftover wrapping paper. Opt for a thicker paper that won't tear easily. You can also use wallpaper that has an interesting pattern. Next, cut some firring strips to size to add to the top and bottom. Macrame DIY projects are a popular way to add some bohemian flair to any space for a minimal investment. The hardest part will be learning the basic knots, which shouldn't take long. You can opt to make a large wall hanging or consider crafting a hanging planter. Most college students are so glued to their cellphones and computers that not knowing the time is a thing of the past. However, this DIY pays homage to the schoolhouse wall clocks that students watch tick away in class. Create a brighter, more cheerful ceiling by adding washi tape to a ceiling fan in geometric patterns. This simple dorm room update will work so long as you remember to remove the washi tape when you move out of the space. Chevron Pattern Fan Blades from Design Sponge. Keep school and/or beauty supplies organized by making a stylish mini rope basket. Part of keeping a dorm looking designer-worthy is making sure everything has a place. This project might not be for beginner DIYers but it's impressive to imagine and might inspire you to take up weaving as a hobby. The smaller you make the rug, the easier the project will be to complete. In college, there's bound to be tons of papers and supplies to keep organized. Instead of piling everything up on your desk, create an organization system using wooden storage boxes. Add some geometric designs using acrylic paint to turn these boxes into pieces of decor. If you attempt this next DIY dorm decor project, make sure you are willing to spend just as much time removing it as you will putting it up. To get the look, purchase a few different colors of washi tape and get started! If applied correctly, washi tape can be removed from walls without damaging them. Consider saving some section of wall for a bulletin board and command center to keep all your school work organized. This dorm room project acts as a storage grid and a modern piece of wall art. Keep things light and inspirational by crafting a felt letter board for your dorm walls. Some claim this project is inexpensive but others claim it costs around $40 to complete. Only you can decide if the cost is worth the final product. Think about a short mantra and determine if it's powerful enough to see every day on your wall. This project will make that mantra both feminine and playful by using wire and faux flowers to spell out the words. If you're allowed to put nails into your dorm room walls, consider this inexpensive faux floating shelf project to give you just a bit more surface area for decor. Gift bags can be reused over and over again, but what about turning the gift bag into something entirely different? If you are particularly fond of the message or pattern of a gift bag, save a ton of money on dorm room decor by turning it into a piece of wall art.